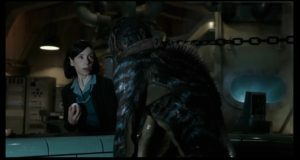 Is The Shape of Water a Hellboy Spin-Off? Is that Abe Sapien from Hellboy? Is this his origin story? These were my first thoughts as I watched the new trailer for The Shape of Water. Set in 1963, the film follows a female janitor named Elisa who works in a government facility with a laboratory. Elisa is a mute and very lonely. One night, when cleaning a laboratory, she discovers a man-like aquatic creature in a tube. She befriends the creature. She shares a hard-boiled egg with him, which he seems to like, and brings him more and more eggs. She tries to teach him the sign language term for “egg.” She plays him music from a portable record player. Elisa makes plans to rescue the creature from the facility. 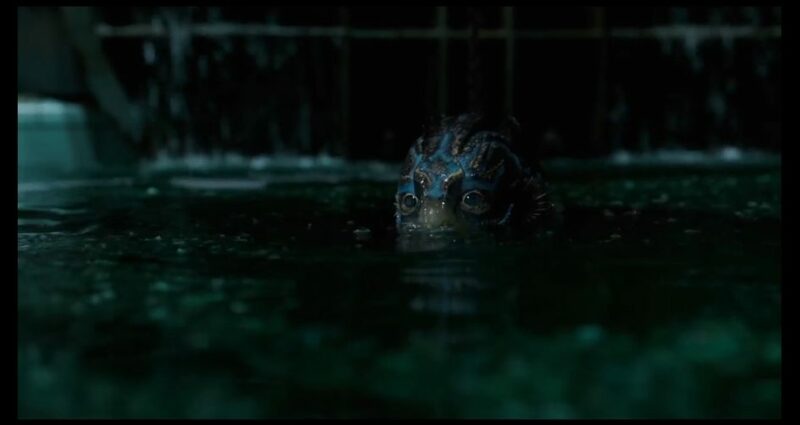 I saw in the credits that actor Doug Jones, who played Abe Sapien in the Hellboy movies, plays the role of the unnamed aquatic creature. I even paused the end of the trailer to see that the film was directed, produced and written by Hellboy director Guillermo del Toro. What’s more, there’s always a record player going in Prof. Broom’s library that houses the large swimming tank for Abe Sapien. 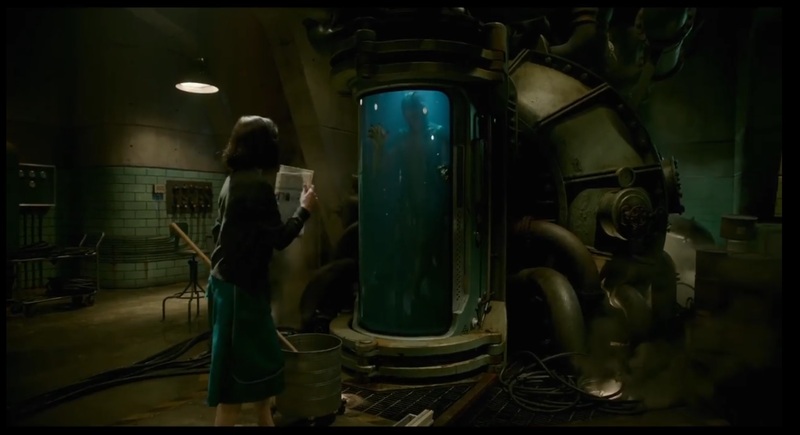 For me, there’s plenty of evidence to support The Shape of Water being an origin story for Abe Sapien. But, then again, I’m a big Hellboy fan. I’ve watched both movies by Guillermo del Toro multiple times. I’ve watch both animated features, Sword of Storms and Blood and Iron, where the movie actors voice their animated counterparts. I’ve also read a ton of Hellboy graphic novels after discovering that my local library carried them, including an Abe Sapien solo adventure called The Drowning. Now, in the Hellboy comics, Abe’s tank is discovered by workmen in 1978 and it’s Hellboy who has the scientists shut down their experiments on Abe at the B.P.R.D. However, the premise in this movie, billed as a romantic horror film, sounds far more intriguing. Actor Doug Jones and director Guillermo del Toro are no strangers in film to romance between creatures of a different species. In the sequel, Hellboy II: The Golden Army, Abe Sapien falls in love with the elfin Princess Nuala. Because they are from different worlds and her brother is the film’s villain, their romance is a doomed one, but it’s incredible to see actor Doug Jones express such deep feelings of emotion behind so many layers of prosthetics and makeup. Whether or not The Shape of Water is an Abe Sapien story, it will be refreshing to watch Doug Jones depict a merman in love again. We have several tales of a man falling in love with a mermaid: Splash, Mr. Peabody and the Mermaid, Ondine — it’s nice to see the other side of the coin. Of course, it’s entirely possible that The Shape of Water will not take place in the Hellboy Universe. After all, a reboot is expected in 2018 titled Hellboy: Rise of the Blood Queen and will be sporting an R rating, according to comic creator Mike Mignola. That film will be directed by Neil Marshall, who directed The Descent and also Dog Soldiers — which were great horror films. I’d often recommend them to customers when I worked at Blockbuster. He also directed several episodes of Game of Thrones, including “Blackwater,” which depicts the famous battle. Hellboy is going to be played by David Harbour, who played Chief Jim Hopper on the Netflix show Stranger Things, whose second season debuts this Halloween. However, we live in a new world of shared universes. Spider-Man shows up in a Captain America movie. Iron Man shows up in the new Spider-Man: Homecoming. Batman shows up in Suicide Squad in Harley Quinn’s apprehension flashback. We get a one-off Star Wars film in the form of Rogue One. Next year we’ll get a Han Solo stand-alone film, apart from and between Episode VIII and Episode IX. Is it too much to hope that we get an Abe Sapien stand-alone origin film, apart from the new Hellboy movie?